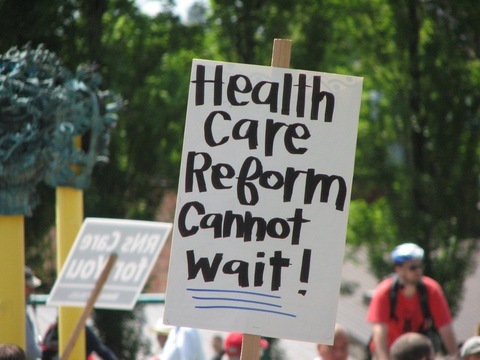 Publicly, consumer and patient advocates continue to cheer wildly for last year’s health care law. Behind the scenes, however, some worry that they are losing a few key battles to the insurance and business communities. They point to a long-sought provision in the law that entitles patients to an external review if an insurer won’t pay for a medical service, but charge that recent regulations limit its effectiveness. One of their biggest gripes? It allows insurers to choose their own “external” reviewers. “Advocates who have dealt with the external review process believe that it’s pretty clear that if [a reviewer] is being chosen by an employer [or insurer] it’s not independent,” said Timothy Jost, a professor at Washington and Lee University School of Law. While consumers should be happy with some regulations, including one requiring health plans to summarize in simple language what their policies cover, Jost notes that other rules “feel like somebody from the Chamber of Commerce got to somebody in the administration.” He points to regulations that he believes are “more friendly” to employers and insurers than to individual consumers. A Harbinger Of Rules To Come? With more regulations on the way, including one that will define what benefits insurers must include in many health plans, some consumer and patient advocates worry that the appeals rule could be a harbinger of things to come. One former Obama administration official says there’s cause for concern. “There’s been a growing sentiment [in the Obama administration], and it’s been there from the beginning, even before health reform passed, of bending to business. Now it’s reaching the boiling point,” said the former White House official, who spoke on condition of anonymity. To be sure, how these rules are written can significantly help – or hurt – consumers, insurers, and businesses, and that’s why so many stakeholder groups are trying to influence the outcome with aggressive lobbying. That presents the White House with a tough balancing act. While needing to reassure individuals that the law won’t disrupt their current health coverage or make it more expensive, the White House also must appease the employers and insurers who are under pressure to make that happen. Consumer advocates are well aware that any controversy surrounding an implementation decision that favors them could be used by opponents as another argument to repeal the law or defeat Obama in 2012. “They all understand that, if he loses, the law and all of its patient protections, including, of course, all of the insurance reforms and coverage expansions, will be at severe peril,” said Chris Jennings, a health care consultant who was a senior health care advisor to President Bill Clinton. Balber complained that the administration made the external appeals rule more business-friendly since its initial version published last year. In the version released this year, consumers’ ability to file an “external appeal” shrunk from four months to 60 days, and the scope of what could be appealed narrowed considerably. It also limited appeals to quarrels that involve “medical judgment” or a rescission of coverage, when an insurer cancels coverage once someone becomes ill, said Stephen Finan, senior policy director for the American Cancer Society’s Cancer Action Network. Those changes mean patients will not be able to appeal anything that falls into the category of contractual disputes – items like whether a particular service or drug is covered — which make up a significant portion of patient appeals, he said. Allowing insurers to sit on boards that govern exchanges, the marketplaces created in the health law where eligible consumers and small businesses can start purchasing coverage in 2014. While insurers say their expertise is needed and valuable, consumer and patient groups say that it could give patients an unfair shake in disputes. Choosing to base workers’ eligibility for federal insurance subsidies on the cost of individual coverage, rather than a family’s premium. The law says that people who have employer-sponsored insurance can qualify to buy insurance on the exchange and receive a federal subsidy if the insurance costs more than 9.5 percent of the person’s income. A regulation released last month said that the 9.5 percent figure would apply only to the cost of individual coverage–rather than family coverage. Many more families would meet the 9.5 percent threshold than individuals. “By doing that they have saved billions of dollars on the budget but they have really hurt lower-and middle-income families who have employer insurance,” said Finan. Looking ahead, consumer advocates are nervously awaiting a so-called essential benefits regulation that will decide which medical services insurers will have to offer in health plans sold in the exchanges as well as in the individual and small group markets. A key goal of the health law was to ensure that comprehensive health policies were offered to individuals and small groups. That’s why the amount of specificity – or lack thereof – in the essential benefits package is critical, said Edwin Park, vice president for health policy at the Center on Budget and Policy Priorities.